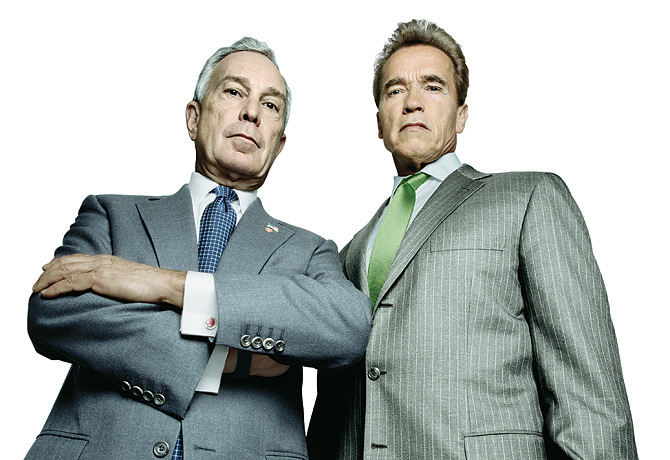 The Hollywood brute and the Wall Street mogul may look like the oddest couple since Twins, but there’s a reason Schwarzenegger calls Bloomberg his soul mate. They’re both self-confident, self-made men who rose to stardom from middle-class obscurity — Bloomberg in Medford, Mass., Schwarzenegger in Thal, Austria — through Tiger Woods-level determination and Donald Trump-level salesmanship. They’re both socially liberal Republicans who have flourished in Democratic political cultures; Schwarzenegger is even a member of the Kennedy clan, through his marriage to Maria Shriver. Two of the court’s biggest remaining cases focus on the First Amendment, and while Alito didn’t mention either, he did make it clear that any restrictions on speech face a high hurdle with him. One case is over whether a principal violated the rights of a student who unfurled a flag saying “Bong Hits 4 Jesus” along a parade route. The other concerns restrictions under the McCain-Feingold campaign finance law on corporations, unions and special interest groups naming federal candidates in ads broadcast in the run-up to elections. Public Citizen filed a complaint with the IRS last year, saying that family members who receive free travel by accompanying lawmakers should pay taxes on the travel’s value. The complaint focused on privately sponsored travel, but Holman said it should apply to taxpayer-funded travel as well. Thompson’s chances at capturing the GOP primary may rest on the answer, thanks to the growing electoral clout of Christian conservatives. The political scientist says he hasn’t been able to find any information regarding the former senator’s actual membership in a local congregation in his home state of Tennessee. On his blog, the professor challenged the Church of Christ faithful to produce evidence they’ve seen Thompson “at an assembly of a Church of Christ (Stone-Campbell) in the last 20 years.” So far nobody has met the challenge. Watching John Edwards is becoming like watching Lost. Each time we seem to get answers we find new questions raised, and in some cases new enemies. ABC News reports two proposals from Edwards which will not get him much support from the pharmaceutical or insurance industries. While some blog comments have dwelled on this factor, in reality they were never going to back him any ways. If there is any danger, it is that this will further give the impression that Edwards is anti-business and alienate many potential voters. The biggest proposal from Edwards is to replace the current system in which pharmaceutical companies have a patent on new drugs for several years, allowing them to charge high prices which the pharmaceutical companies claim are necessary to fund further research. I wonder how much of it is also to fund all those glossy brochures on their drugs which wind up in my trash immediately upon receipt. I doubt this proposal has much of a chance, but much more information on the details is needed to evaluate. Edwards also proposes to require insurance companies to spend 85% of premiums on patient care. He states that currently 30% of premiums go to administrative expenses, but that New York, Minnesota, New Jersey,and Florida impose similar restrictions. It’s been impossible to ignore all the publicity about Paris Hilton, and difficult to resist posting on. It was just too hard to resist blog posts entitled Paris Has Been Liberated! and Paris Burning. I’ve heard claims that Paris was being treated more harshly than others with similar offenses would, but I’ve actually only paid marginal attention to the whole affair and hadn’t seen any clear evidence either way. Today the Los Angeles Times presents an analysis,and also turns this into a real story as opposed to celebrity fluff, ensuring that we’ll always have Paris. The Times analyzed 2 million jail releases and found 1,500 cases since July 2002 that — like Hilton’s — involved defendants who had been arrested for drunk driving and later sentenced to jail after a probation violation or driving without a license. Had Hilton left jail for good after four days, her stint behind bars would have been similar to those served by 60% of those inmates. But after a judge sent her back to jail Friday, Hilton’s attorney announced that she would serve the full 23 days. That means that Hilton will end up serving more time than 80% of other people in similar situations. Paris Hilton shouldn’t be given special treatment due to her fame and wealth, but neither should she be treated more harshly than the vast majority convicted of similar offenses.